18 and 24 versions are also available, please contact us for details. 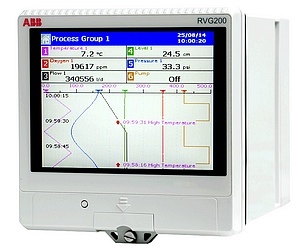 The ABB ScreenMaster RVG200 is a secure, easy-to-use paperless recorder. Process signals can be connected directly to the RVG200's analogue inputs or transferred to it via digital communications. Supply Voltage: 100 to 240V AC ±10 % (90 min. to 264V max.) 50 / 60 Hz, 24V DC (23.0 to 24.5V DC) (AC and DC ranges have different terminals and only one type of supply can be connected). When used with thermocouples, the RVG200 can either have 1 CJC measurement sensor (supplied) per board (6 channels) or as many one CJC sensor per channel (giving the highest level of accuracy). Extra CJC sensors can be ordered separately if required: ABB CM30 / RVG200 CJC Sensor Terminal Module.